In other words…data about publications, or citation frequency. A student asks you "What are the best journals in my field?" A professor asks you "How do I check who is citing my articles? How many times have I been cited?" A student asks you "How do I know this article is important?" A professor asks you "How can I compare the research impact between journals so I know which journal should I publish in?" This guide includes content adapted with permission from Bodleian Libraries, University of Oxford and Robin Kear, Liaison Librarian, University of Pittsburgh. 80% of the citations come from about 20% of the journals cited, identifying a core list for a local journal collection. 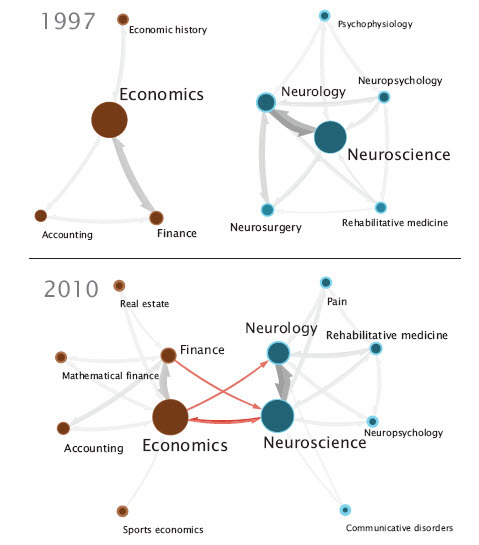 This map, constructed using journal-level citation data from the Journal Citation Reports, highlights the role of neuroeconomics in bringing together research in economics and in neuroscience.